You are here: Home » Food Drink » Cake in mason jars. Combine sugar and shortening until well blended. In separate bowl, beat egg whites until light and frothy. (about 3 minutes) Sift baking powder into flour. Add flour to sugar mixture alternating with the milk. Add extract. Gently add egg whites and fold in until just combined. 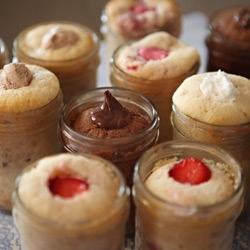 Add 1/2 cup cake batter to well greased jar and bake at 325 for 35-45 minutes. The goal is to make sure the center is not raw, hence the longer cooking time. Start watching your jar at 30 minutes to make sure you don’t over-bake. I loved the original recipe’s take on individual cakes, but I wanted to use the ingredients I had available, and to change the chocolate ones in particular to use Nutella, which I knew my coworkers love.